So many issues with the Olympics, makes me wonder why any country or city would be willing to host? That said, will you be watching? What are the best medal hopes for India? As much as my time and Rabbit antenna allows. Saw the opening ceremony on my rabbit antenna. 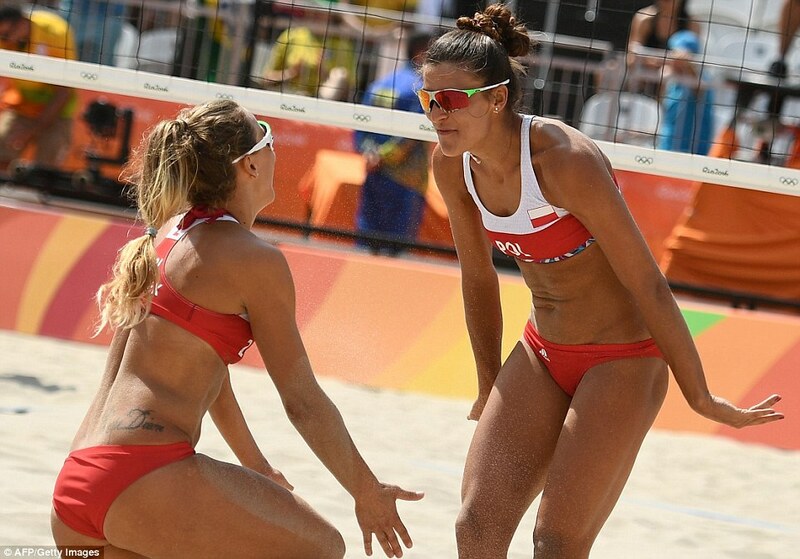 And now catching up on Beach volleyball (women's of course) - Fredrick/sweat vs poland. Just when i thought "good they dont have quota in beach volleyball unlike wrestling", it flashed on tv that max 2 teams are allowed. The other pair is Kerri Walsh / April Ross. Indian hopes will be in Boxing,shooting,hockey,wrestling. The NBC commenter daid it all during the opening ceremony when India walked in. "Second most populous nation, but not much of an Olympic power. Flag bearer is Abhinav Bindra who is the only individual gold medalist from India." It may improve the tally, but a long way to go. Probably Ethiopia has more gold medals in the last 30 years. From this match. Polish team in red won and Umrika in blue lost. Have been watching olympics on free tv NBC channel. Too much swimming coverage, I guess the downside is that they show only sports where Americans are competing. Watched some tennis online .. Rafa won, Venus lost, I'm glad #1 Djoko lost. Apparently the Argentinian he lost to, Del Potro got stuck in an elevator earlier yesterday for 40 minutes. I guess it angered him enough to stop Novak from getting a medal the second time in consecutive Olympics. In London too Djokovic lost to Del Potro, in the bronze medal match. Last edited by Charchila; August 8th, 2016 at 10:23 AM. Luckily, where I live, I get over the air coverage from Canada. So get to watch a little non-America focused coverage. The good thing is that after all the negative coverage that Rio got before the games started has been pushed out by the good start to the actual Games. The dominance by the US women's gymnastics team is just amazing. I guess growing up we were so used to seeing Russian, Romanian and Chinese gymnasts -- last 20 years or so, the American women have blown away the competition. Zorro pai, would you mind maintaining the original post with a quick summary of useful/important updates for a quick glance? LOL, instead of comparing to China, he chooses our lesser privileged neighbors to compare! As i said, even poor african countries would be higher up. But in a way the achievements are great given the crappy 'Sports Administration'. watch Mary Kom. i am trying to fetch an episode of 'Jaspal Bhatti's ulta pulta on the selection. Last edited by sarv_shaktimaan; August 8th, 2016 at 06:46 PM. probably many of our athletes are vegetarian and dont have the stamina and strength that nonvegetarians have .